Seasonal affective disorder (SAD) is a form of depression that occurs at the same time each year (usually with the onset of winter) and disappears at the same time each year (typically at the start of spring). SAD is linked to the availability of daylight and is found most often in the Northern Hemisphere. Many people get the winter blahs or cabin fever as the days get shorter and colder, but for about 10 million Americans with SAD, shorter days mean a slide into true depression. SAD is a seasonal pattern of depression. It occurs in about 5 of every 100 people. Four times more women than men experience SAD, and it can also occur in children and teens. The farther away from the equator someone lives, the higher the risk that he or she will experience SAD. One study has estimated the incidence of SAD in the general population as only 1.4 percent in Florida but 9.7 percent in New Hampshire. This comparison suggests that in the southern United States only about 1 person in 100 has this condition, but in the north, the number may be as high as 1 in 10 people. As autumn arrives, the number of daylight hours declines. The effect is greater the farther north a person travels from the equator. Daylight also can be decreased by cloud cover in specific areas of the United States, such as the Great Lakes region. It is believed that for some people the decrease in available daylight causes a decline in the neurotransmitter * serotonin (ser-a-TO-nin), in the brain. A decrease in the amount of serotonin in the brain has been linked to depression, because serotonin typically is associated with feelings of well-being. In the autumn, after a few weeks of reduced serotonin levels, a person can start to show signs of depression. If left untreated, the depression may continue throughout the winter and then disappear in the spring as the number of daylight hours increases. SAD is diagnosed in people if they become depressed in the fall and winter for two or more consecutive years, with periods of normal moods in the spring and summer, and if they have no other problems that might account for seasonal depression. A rare form of SAD, called summer SAD, occurs in reverse of the normal pattern. People with summer SAD become depressed during the summer and feel better in the winter. * neurotransmitter (NUR-o-tranz-mit-er) is a chemical messenger that lets brain cells communicate with each other and therefore allows the brain to function properly. Winter depression is a common type of SAD that is caused by the dramatic decrease in sunlight when the seasons change. Patients who undergo light therapy may sit in a light box for about a half hour a day throughout the fall and winter, until springtime when there is more natural sunshine. Once it has been diagnosed correctly, seasonal affective disorder can be treated with light therapy. 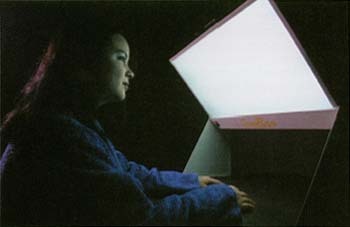 People with SAD sit in front of special bright light boxes or wear light visors for a period of 30 minutes to 2 hours every day, glancing occasionally at the light. To be effective, the light must enter the eyes and not just fall on the skin. Occasionally, people report eyestrain or headaches from the light devices, but usually there are no negative side effects. When natural daylight increases, people with SAD discontinue light treatment. Depression and Related Affective Disorders Association (DRADA), Meyer 3-181, 600 North Wolfe Street, Baltimore, MD 21287-7381. A self-help and educational organization for people with depressive illnesses and their families.